One of the most significant trends in executive education has been the decline in company sponsorship of degree-seeking employees. In 2000, 55% of students received full employer sponsorship. This fell to 32% in 2009, and 23% in 2016, according to the Executive MBA Council. If you seek company funding and time off work, you will need to start early to convince management that your Executive MBA will benefit the company, and that your time away from work will not be disruptive. 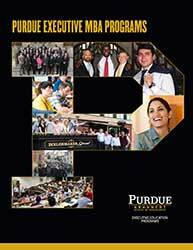 For the Purdue EMBA, we have found that 25% are fully self-funded, 50% receive partial company support, and 25% are company sponsored or use the Post-9/11 GI Bill. Please find more information about funding your degree in the dropdown menu at right.